For a city girl, like me, this admission comes as a continuous revelation and constant amazement. Barely, a couple of years ago, I would find that title a laughably erroneous judgement of me. I was a thoroughbred city lass, a lifetime Manhattan-er. Lifting the veil back to a few (!!!) years ago, as child I squealed at the sight of raw meat (I devoured it nonetheless when it arrived packaged in spices at the table) and even swore off meat for a whole week when I partially witnessed the killing of a chicken (humanely, might I add). For several years, my mother attempted to lure me into the kitchen. Ah! But then she used the wrong language. For her, the kitchen was needed education for all girls in a lifetime service of feeding of the 'family'. For me, it was a shackle and I vowed to not be tied to those traditional expectations of society and flatly refused to enter the kitchen. Years passed. I had well established my break away from the mold. But, the need to feed myself as I was making said break, pushed me into that nefarious part of the house. Life happened along the way thrusting me ever more into that space and that, surprisingly, became my happy place, solace even. Long story short, I became the cook I am today, one that thoroughly enjoys whipping up mega spreads and one who does not shy from hours of laboring for a making a cherished dish. Yet, it does not fail to amaze me that even today, I am impressed, grateful, happy to have that skill to able to make memories with food. Every time, I set a perfectly cooked plate on the table I am filled with a deep sense of satiation, joy and pride. Ever more, every day, I yearn to be closer and more granular with my food. From cleaning whole fish to making blood sausage to growing my herbs, I want to get my hands dirty and rejoice in how much pleasure it gives me. I have even gone so far as to want to spend time with cattle, watch farmers at work to wanting to watch slaughter, all in the quest to get real. Then, one day, I realized I wanted to be closer to the country and away from the city. As a micro-step, this involved moving away from Manhattan into Brooklyn. The remarkable success of it and resulting peace of mind only validated the slow move away from apartments. Anyway, I have often wondered on the philosophical rationale behind my changing propensities. I have come to realize that in not having grown in the country I harbor a certain deficiency in truly understanding the cycle of life. The ability to understand choices and the fortitude to make them consciously. Clearly, in my straight-nosed model based approach to fill that tiny dent, I had decided that the best solution to that is to displace my nurtured tendencies and retire to nature! Only posterity will be witness to the consequence of this thinking. In the meantime, reality of existence and my handicap is really living a rural life, keeps me one foot in dream land and the other dragging itself closer to the utopia through some pragmatic steps. Essentially, I cook more, make more things from scratch, satiate my curiosities of grandma's style cooking of every region, voraciously read of (and imagine myself in) idyllic countryside locations and build castles in the air. As you can imagine, this all comes with its fair share of successes and failures. The latter instills tenacity and perseverance, qualities I associate more with outside-the-city rather than competitiveness and convenience. This year, apart from being successful in planting and keeping an herb garden alive (the peas and squash died btw), I started making raw butter, granola, pates, and almond milk. 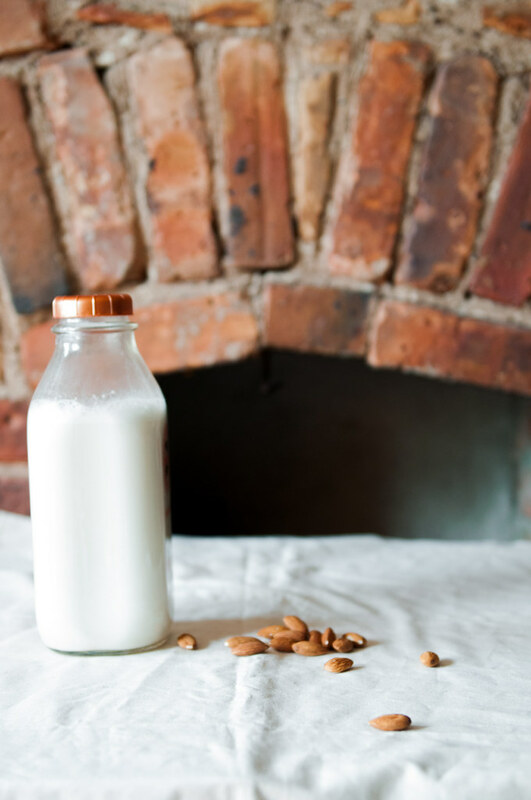 And, today, I want to talk about making creamy, smooth almond milk that does not split in hot tea and that lends a lovely flavor to morning cereal and work fantastic in dairy free, vegan puddings and bakes. 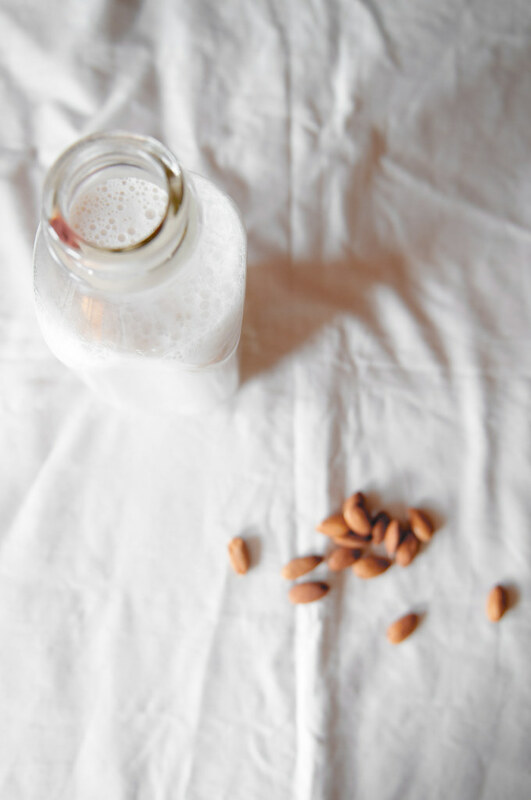 Making nut milks is not difficult. All you need is a high power blender and a strainer. The flavor is very much of individual taste. The true test of successful nut milking is in the texture . Getting the right consistency is half the battle. The other half is retaining its longevity of the texture. 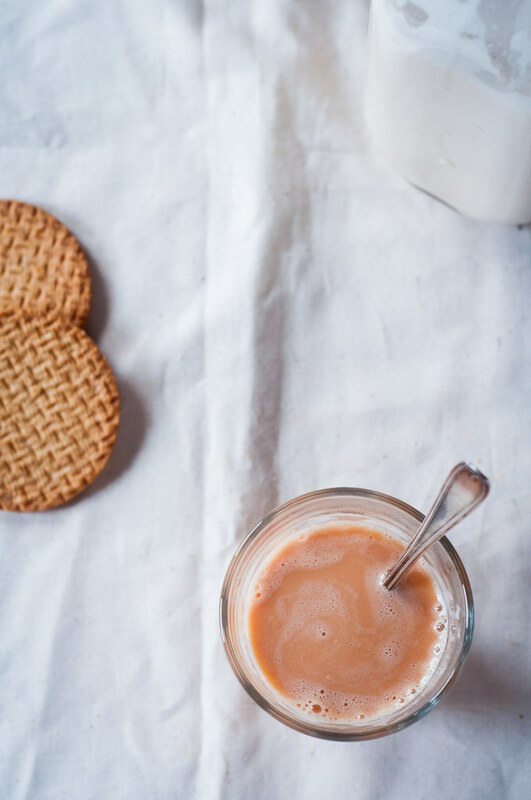 The common complaint to homemade nut milks is that they split/curdle when added to hot liquids because the fat separate so quickly. Commercial nut milks have added artificial stabilizers whose lack is a big advantage of the homemade. 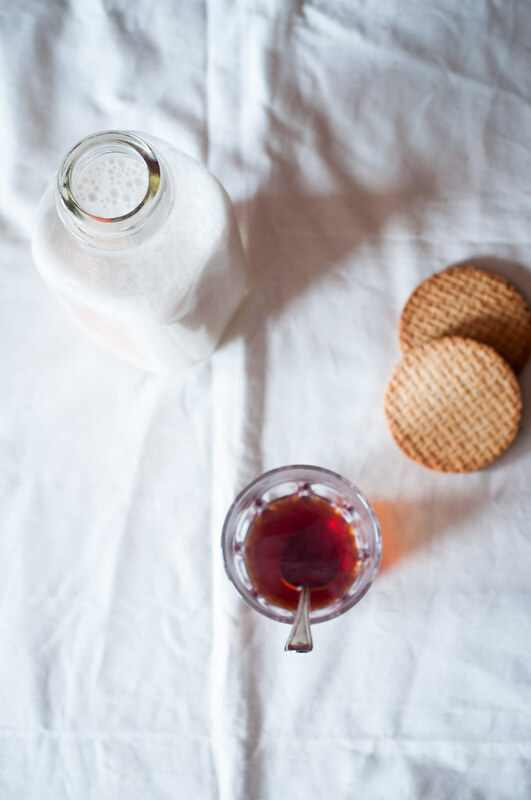 What I give you today is a recipe for milk that does not split or curdle, in the bottle or in the glass. Milk that stays fresh for as long as 5 days. All naturally. This does need THREE important notes that have to be heeded. First, always use almonds soaked for at least 3 hours. 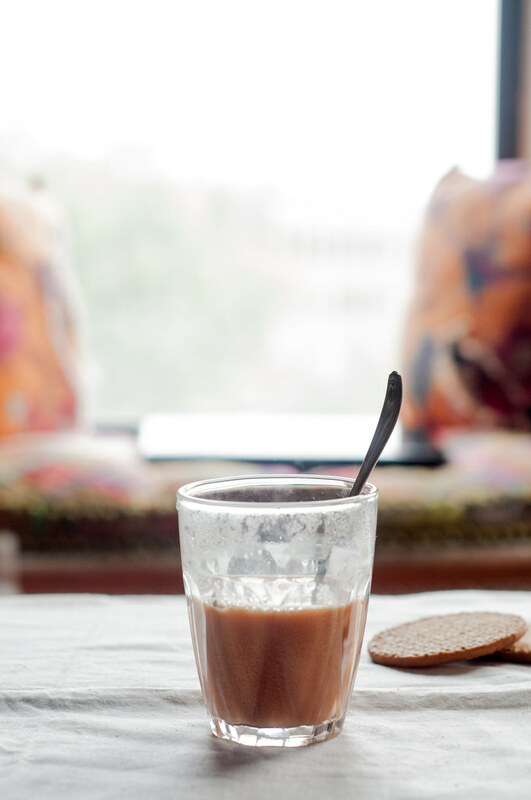 Second, after several trials and fair few split milks, I realized that a combination of dates (to sweeten) and cardamom (for very very mild flavor) acts as a natural stabilizer. Somehow these natural ingredients bind with the nut fats suspending them in an emulsion that holds rather strongly. Third, the temperature of your fridge must be cold enough to 'freeze' the emulsion and prevent the fat from becoming rancid but not too cold that it actually freezes the fats. If it is too cold then when the fats comes into contact with hot liquid the sudden shock causes them convulse together and curdle. I have found the optimal temperature to be around 30 F with degree or two of variation tolerated. Soak the almonds at least three hours to overnight. Set aside for 15 minutes for the husk to separate and float on top. 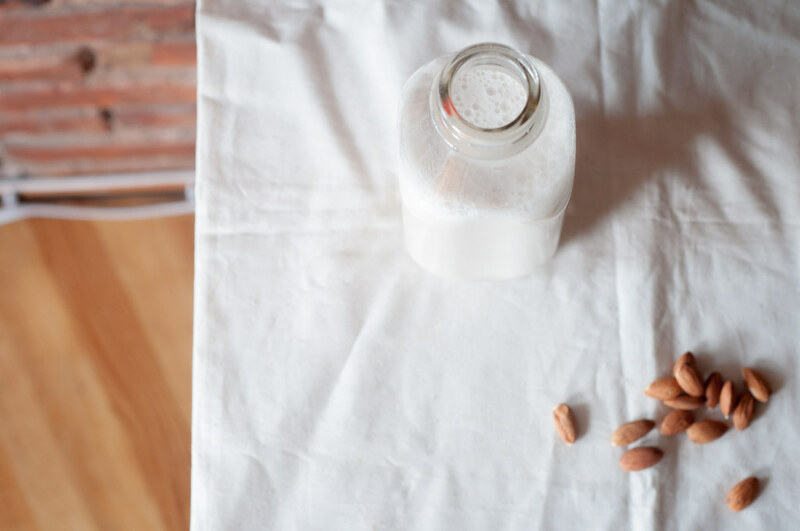 Use a nut milk bag to strain the milk and paste. 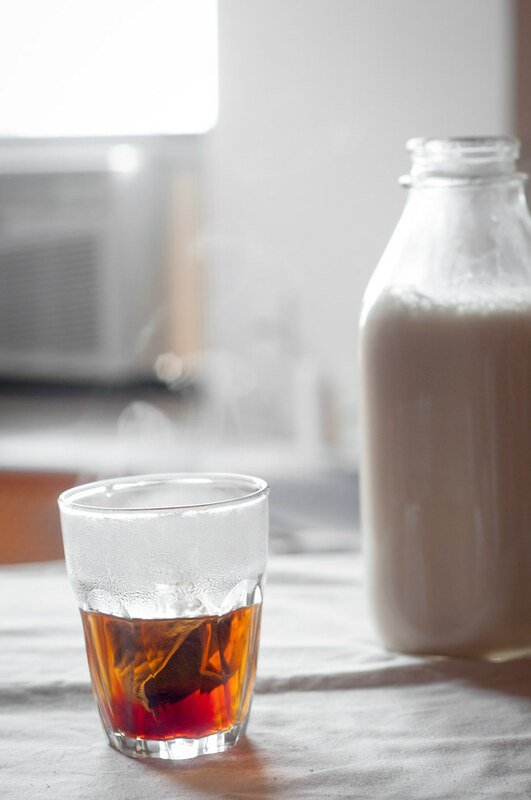 Store in a milk bottle at the appropriate temperature.